Leatherback sea turtle carcass set for necropsy. A 647 lb endangered leatherback sea turtle was found frozen in the ice along the shoreline of the Bras d’Or Lake in Cape Breton Island, Nova Scotia on February 8th, 2018. This particular leatherback was the first to be officially documented in the lakes, although there is some anecdotal evidence provided by locals that leatherbacks have been sighted in the lake previously. The turtle was thin so it is speculated that it died of emaciation (presumably due to lack of jellyfish to eat) but further testing will be necessary to confirm this theory. Fisheries & Oceans Canada officials from Sydney transported the turtle to the Canadian Wildlife Health Cooperative at the Atlantic Veterinary College, UPEI on Feb. 15th, where a necropsy was performed by pathologist, Dr. Laura Bourque, to determine the health of the animal and hopefully a cause of death. The turtle carcass was reasonably fresh since it was preserved in the ice. Leatherbacks are the further northern ranging sea turtles because they have thick subcutaneous blubber layer, however, we would expect that during the winter months it should have migrated south. It is possible that it got lost in the lake during its southerly migration and couldn’t get out again. 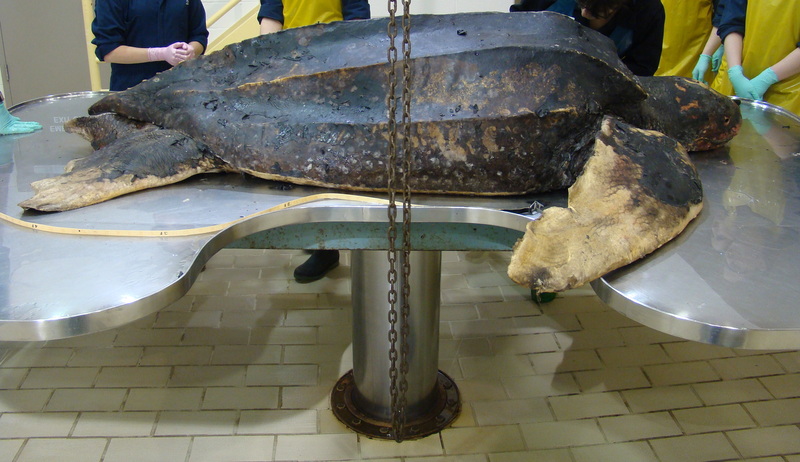 In 2012 another leatherback turtle was found 20km up the Shubenacadie river in mainland Nova Scotia. You can read the entire story here.